The Teacher Effectiveness Enhancement Programme (TEEP) draws on significant research that has identified what is required of teachers and of learners, in order for them to gain the best learning outcomes possible. TEEP is a proven, well regarded and successful model. Over 250 schools and 6000 teachers have engaged with TEEP through SSAT. 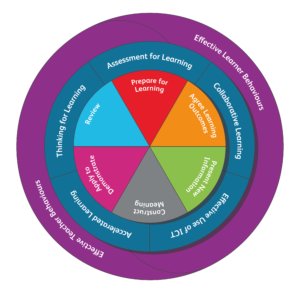 The model is made up of three significant components – each with important elements that are inextricably connected yet need to be recognised individually for their contribution to the teaching and learning process. The training is crafted to pull together these three areas in a practical, interactive way. Each activity models the model and the debriefing ensures a deeper level of understanding of effective teacher and learner behaviours. A mind-shift from what you are going to teach, to what the children are going to learn. Activities such as the Tower of Power, world café and expert challenge places the teachers in the position of learners in a non-threatening, inspiring but always challenging environment. Participants will leave after the first part of the training eager to try new ideas that will then be debriefed and reviewed in the next part of the training (usually two months after part a) and take TEEP to the next level. Level 2 TEEP trains key members of staff to coach others within school to take TEEP forward through TEEP-focused observations and effective feedback. The framework is designed so you can incorporate what you already do on order to develop a common language of learning across the school. TEEP is suitable for primary teachers at all stages of their career and for schools and academies at all levels, enhancing classroom practice from ‘satisfactory’ to ‘outstanding’. Find out more about the TEEP pedagogical model here. Hilton Primary Academy, is a school with 400 children in the North East. They believe in giving their children fantastic learning experiences through a diverse, rich and creative curriculum. Their aspirations towards continuing improvement, led them to find out more about SSAT’s Teaching and Learning Programme the Teacher Effectiveness Enhancement Programme (TEEP). Read more here. Find out more about the impact of TEEP here, including more case studies from primary and secondary schools.